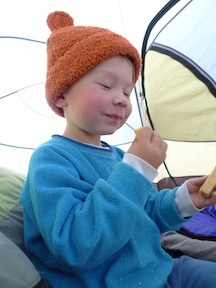 Starboy celebrated spring with an Easter basket this morning, during our desert camping trip. His favorite part was the shortbread cookies. Starboy was very curious to discover what was inside the treasure eggs. He tried to convince us to open them for him. Techman caved and suggested he smash the eggs open. 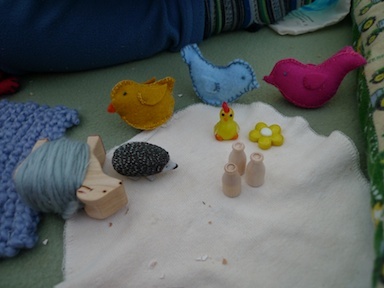 Wooden lamb and cloth to accompany Pelle's New Suit, plastic hedgehog, felt chick, felt birdies, glass chick and flower for the nature table, and some refreshments for the gnomes. Oh, and the cookies, which were long gone before making this photo. The hedgehog didn't survive in its pictured form. I was putting Starboy's initials on the bottom of him when the silver paint pen—affected by the change in high-desert altitude—splurted all over the thing, turning it entirely silver. The little guy looks like he's been chromed. I think I'm going to owe Starboy a new hedgehog. Easter's not usually a big holiday for us, but a lot of tiny spring treats added up to a pretty deluxe basket this year. He's really enjoying the Pelle story. 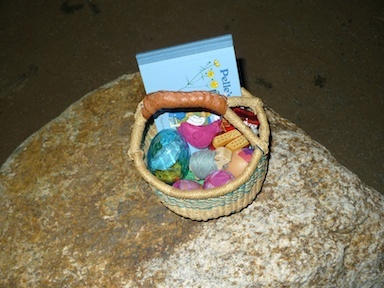 Last year's basket was rich as well, with some hand-felted eggs I made to hide treasures in, some Mama Roots bunnies and a reprise of the previous year's Earthentree maraca eggs, all on a playsilk. 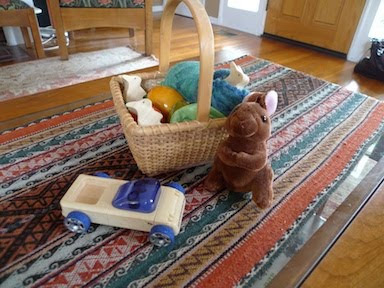 The Velveteen Rabbit — also a reprise from his first Easter — now plays along with his storybook and the Automoblox car gets heavy daily action. Lots of re-gifting, but he still enjoyed the take. And we'd rather have a few nice things that will hold his attention than a lot of plastic junk. Um, like the plastic junk I used to fill the eggs for the afternoon egg hunt. Ahem. But Starboy was so enthralled with the wolf he found in the first egg he picked up, he gave up the rest of the hunt, entirely. And other kids were glad to snag his loot.